When disaster strikes, heroes emerge. Heroes come from many places. The police, firemen, and emergency responders deserve all the praises that are heaped on them by virtue of them putting their lives on the line every day. Soldiers here and abroad should earn our utmost respect for their incredible sacrifice to protect our country. Hurricane Sandy brought forth to national consciousness the noble women and men in nursing. Because of generator failure, New York University Langone Hospital was forced to evacuate some 200 patients to nearby hospitals. What makes this truly incredible was the fact that the transfer was made during the height of the hurricane, at a time of dangerous winds and unrelenting rains. On February 12, 2013, in his State of the Union address, US President Barrack Obama honored one nurse who exemplified the nobility of our nursing profession. MENCHU DELUNA SANCHEZ, a Filipino registered nurse in NYU-Langone, thought of the plan and organized a group of medical professionals to carry 20 critical babies down nine flights of stairs, with illuminations from cellphones to guide them along the way. The medical team composed of nurses, doctors, medical residents, ancillary staff, and hospital administrators joined in perfect harmony to carry those precious babies to safety, and to other hospitals which welcomed these patients. All of these efforts happened during the height of the storm. A picture of a nurse who hugged a premature baby to her chest as she gingerly led the way down flash-light lit stairway with her team of doctors and ancillary staff gave me chills. I thought of the premature baby whose very survival depended on the commitment of each member of the team. I thought of the baby’s parents as they worried about their child. For all the parents, the hospital staff members were the angels sent to protect their own little angels. While Sanchez was saving lives in the hospital, her own home in New Jersey was flooded rendering the first story of her house still uninhabitable to this day. But on that Tuesday evening, as Menchu Sanchez joined the First Lady Michelle Obama and the Vice-President’s wife Jill Biden in that honored spot, it must have been a surreal experience to be celebrated for a job well-done in a setting that only a few had achieved. It was a fitting tribute to nurses everywhere, and to all Filipino nurses who had identified with her work ethic and professional integrity. As a profession, we had long fought for recognition, and a Filipino nurse received this singular honor. For Menchu, it was probably a culmination of years of hard work and dedication to her nursing profession. Mabuhay, Menchu! I celebrate your achievements. You make us all proud. You’ve come a long way from your native Philippines. 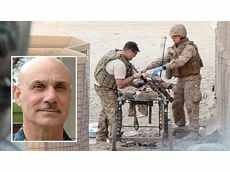 In Afghanistan, JAMES GENNARI, BSN, RN, TNS, As department head for a mobile ED and shock trauma platoon, with an explosive ordinance removal specialist removed a 14″ rocket propelled grenade that was embedded up to the patient’s buttock in three tugs. 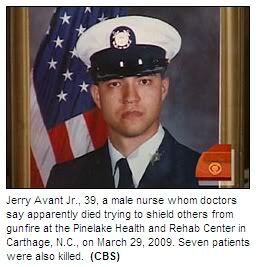 JERRY AVANT, JR. died while protecting others. Doctors said the 39-year-old male nurse was shot more than two dozen times Sunday while trying to shield others from a gunman at a Carthage, N.C. nursing home. Nurses do great things every day. As part of their daily lives, they care for their patients even though they are under-paid and under-staffed. Their efforts are unsung, and mostly under-appreciated. But in extreme circumstances, a few nurses shine more than others. They do things above and beyond. These are the nurses who selflessly rise above their own expectations and who provide the care that can only be called heroic. It is so heartwarming that the nurses are finally getting their spotlight. Well done my mga Kababayan..
as searching for a related matter, your website got here up, it seems to be great. I am gonna watch out for brussels. I’ll be grateful in case you continue this in future. Numerous other folks will probably be benefited out of your writing. Cheers!